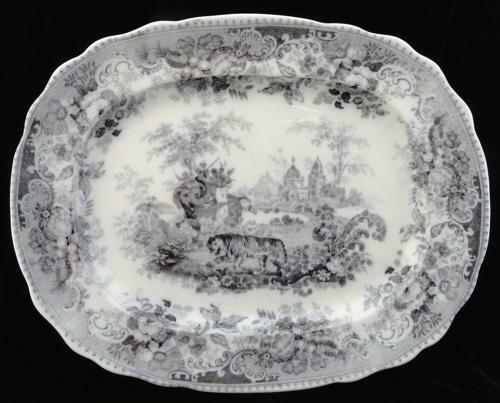 This spectacular earthenware Staffordshire transferware platter measures a generous 17 " long x 13 3/8 " wide. The piece is impeccably potted and transfer printed in a flow black or mulberry, very appealing to flow blue collectors. Ponding of the pearlware glaze gives the platter a 3-D view. Rare to find in this color and a rare pattern in any color. has an Elephant with hunting party and a Bengal Tiger. An absolutely stunning composition. Never Used. The platter is in great condition A heavy application of the pearlware glaze, three normal stilt marks to the face of the platter.